This work is an in-depth analysis of the full breadth of Sojourner Truth's public discourse that places it in its proper historical context and explores the use of humor and narratives as primary rhetorical strategies used by this illiterate ex-slave to create a powerful public persona. The book provides a comprehensive survey of the life of Sojourner Truth, and includes a unique and authoritative compilation of primary rhetorical documents, such as speeches, songs, and public letters. 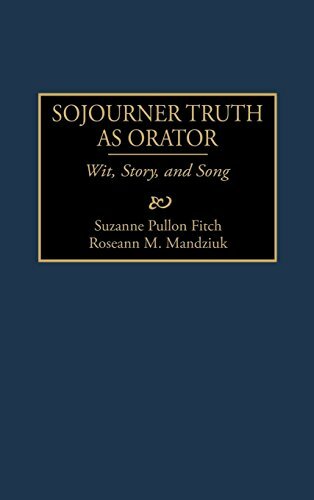 This is the only major work to date that analyzes the breadth of Sojourner Truth's public discourse. The volume includes a complete and authoritative compilation of her extant rhetoric, including several versions of the same speech, reports of her speaking appearances, public letters published by Truth in newspapers, and songs written and performed by her as part of her public lectures. Three chapters address the rhetorical dimensions of Truth's public persona. First, an historical survey contextualizes her life and speaking from slave to reformer, placing into perspective the variety of experiences that comprised her background. Second, an analysis of Truth's use of humor focuses upon how she employed the strategies of superiority and incongruity in her refutation of opponents and the establishment of her own credibility. Third, a critique of Truth's use of narratives in her discourse reveals how both her speeches and songs rely upon three fundamental stories for their persuasive impact: her slave life and religious conversion, her use of the black jeremiad to portray race differences, and her tales of woman's strength and moral conviction. The volume concludes with a consideration of Truth's status as a folk legend and how she wished to be remembered.